While berries and stone fruit are at their peak, I can't resist using them in every which way. 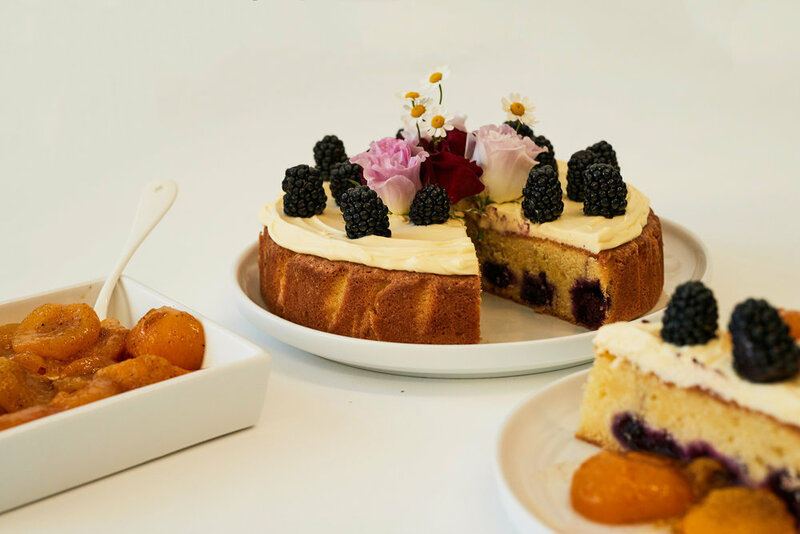 The berries in this cake, as well as the apricots are completely interchangeable, so if you prefer raspberries or blueberries, apricots or peaches, try those instead. A simple lashing of unsweetened mascarpone is all this cake needs to make it 100 per cent delectable. First, make the cake. In the bowl of an electric mixer, cream the butter and sugar until pale, light and fluffy. Beat in the eggs, one at a time, along with the vanilla. Gradually fold in the flour and ground almonds. Pour the batter into the cake tin and spread out to the edges. Evenly dot in the blackberries. Meanwhile, make the apricot compote. Add the pitted apricot halves, honey, vanilla pod, lemon juice and water to a medium saucepan and stir gently to combine. Cook on medium heat until the apricots begin to release their juices. Turn up the heat a little and gently simmer the apricots, stirring occasionally, until they are very soft but still holding their form. This should take about 10 minutes. Taste the compote and add a bit more honey if you find it too tart. Remove the vanilla bean pod. Once the cake is fully cool, neatly top it with the mascarpone. Decorate with fresh blackberries, and flowers if desired. Serve with a generous scoop of apricot compote. To store, refrigerate in an airtight container for up to 3 days.